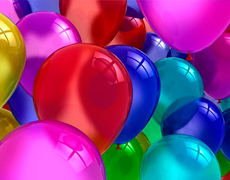 Surprise your loved one with twelve helium balloons for that special occasion! Your choice of message on the balloon: "Happy Anniversary", "Happy Birthday", "Honeymoon", etc. Give your suite a true celebratory atmosphere when you arrive! 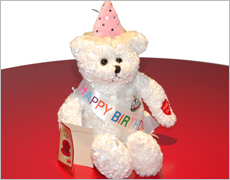 The Happy Birthday Bear is a great gift idea for anyone's birthday. Squeeze its paw and it sings Happy Birthday! Enjoy a special birthday for 2 with a bottle of champagne, (6 chocolate covered strawberries or 2 decadent cupcakes with a candle), six helium balloons, a romantic dice game, pheromone sheet spray, and to top it off: Luv Cuffs, a whip and a bottle of whipped cream. Getting older has never been so much fun!! One-step ordering to a complete birthday atmosphere! You will have a Happy Birthday Banner, up to 4 cupcakes (one per person), Six Helium Balloons, a Wrapped Birthday Gift for the birthday star, Birthday Party Favors in your room before you arrive, Up to 4 goodie bags with treats and toys and pin the tail on the donkey. (add $11 per additional guest) Guaranteed to make their birthday off the hook! !